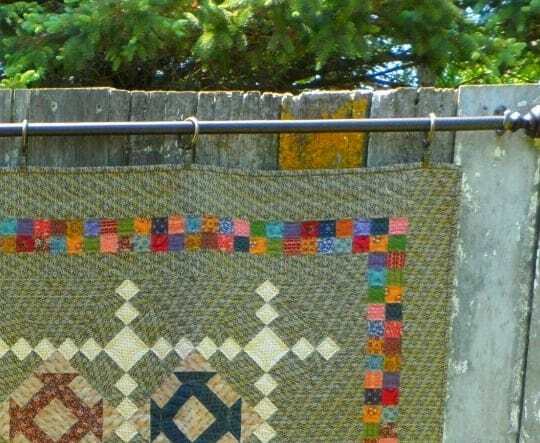 Handy Tips When Finishing That Quilt! Mid-August doldrums here …. it’s that time of the summer when you begin to notice signs of the coming fall. The gardens look a little less vibrant, the lawn not as green (especially here in north Iowa because we need rain!) and school is starting. I just sent my son back to his 2nd year of law school, so the house is quiet again…. a bit too quiet. I don’t think I’ll ever get used to the empty nest. At least I have Addie to keep me company! She’s usually good for daily entertainment in the studio. 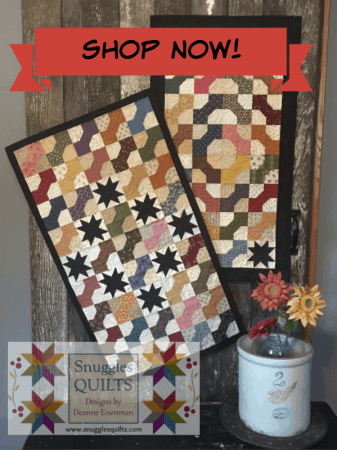 I have been working on finishing a stack of small quilts this week when it occurred to me I had some tips I could share. I’ve had a lingering cold this week, so the fact that my brain is working enough to come up with a blog post idea is exciting! 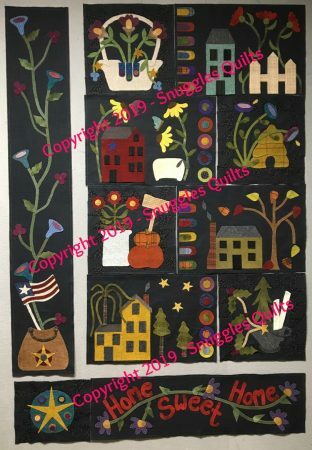 For a wall hanging or larger quilts that needs a hanging sleeve, I will cut a 2 1/2″ strip of fabric, either the same as the binding fabric or the backing fabric. 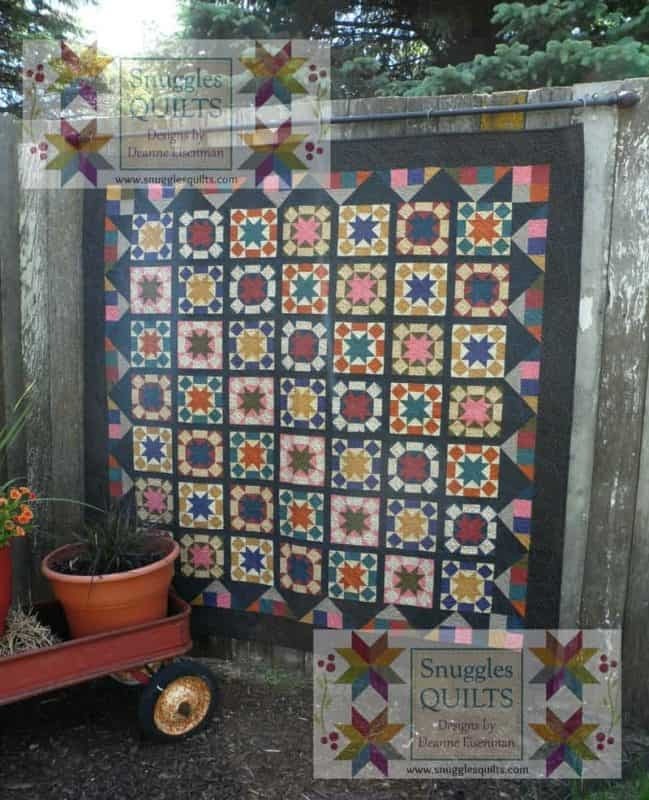 The strip should be about 1″ shorter than the width of the quilt you want to hang. 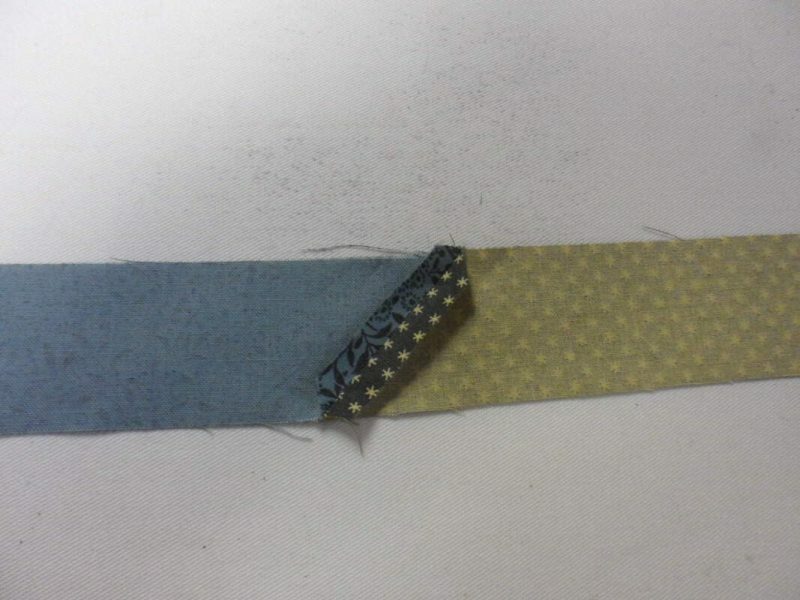 For example, if the quilt is 24 1/2″ wide, I’ll cut the strip 2 1/2 x 23 1/2″. Then, place the strip at the quilt’s top lining it up with the raw edges. Pin in place. Once that it done, stitch the binding on the front of the quilt. 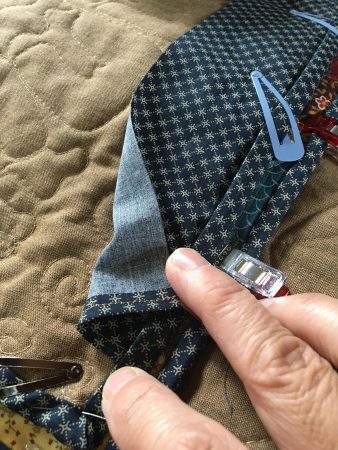 When you get to the top of the quilt, the top of the hanging sleeve strip on the back is stitched to the quilt top as you are attaching the binding to the front. 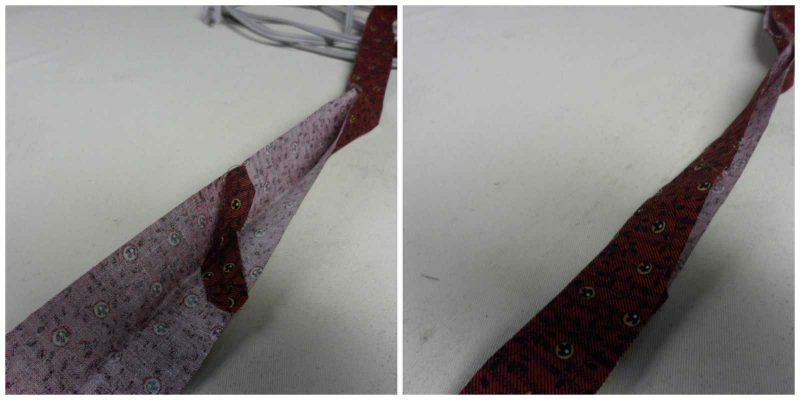 Be careful that the strip is not folded up as you are stitching. This is what it looks like when you are done. As you can see, the top of the hanging sleeve is secured. 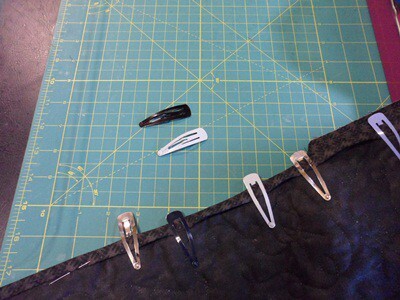 To finish, simply fold about 1/4″ under and hand stitch the bottom of the hanging sleeve. 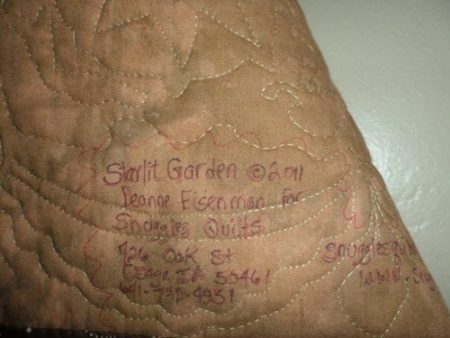 We all need to remember to label our quilts better. It’s good for family history or even for our own memory! If you take care of affixing the label while you are doing the binding, you won’t have to worry about it later. The steps are similar to the hanging sleeve tip. I usually press the two sides of the label that will not be sewn into the binding be for placing it on the back of the quilt. 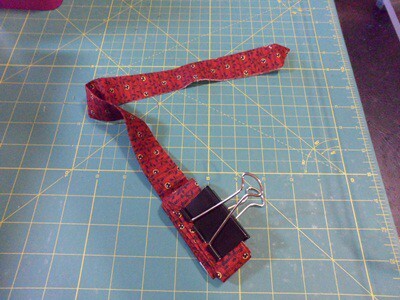 This will make it easier to stitch down those sides later. 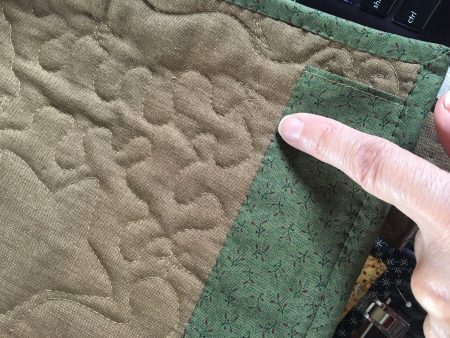 Once you have the sides pressed, lay the label right side up on the back of the quilt aligning it with either the bottom left or right corner. 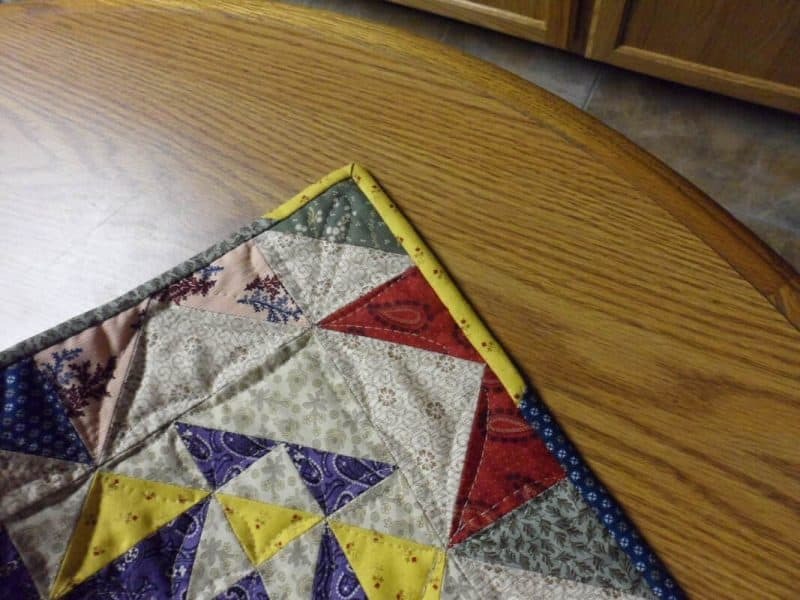 Pin in place so you can move on to stitching the binding on to the front of the quilt. 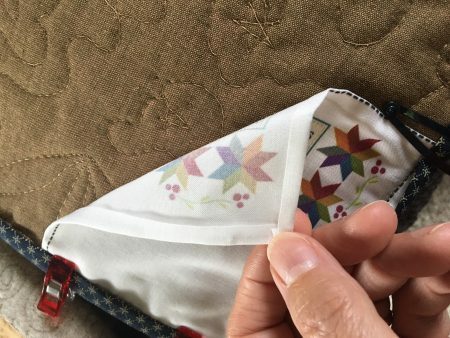 The two sides of the label that are aligned with the edges of the quilt will be stitched down when you stitch the binding. Like with the hanging sleeve, be careful not to catch the loose part of the label in your stitching. 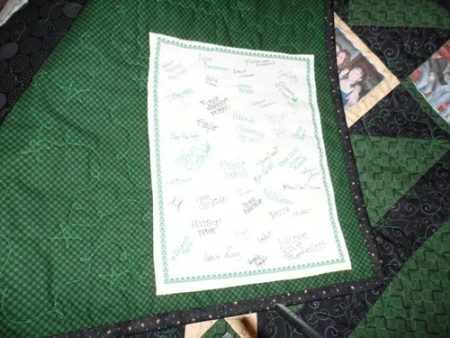 Now with a permanent fabric marker, I have plenty of space to write the name of the quilt, year made and any other information I would like. Instant documentation! So there you have it. I hope these two little tips are useful to you for future projects! Do you Label? I hope so! 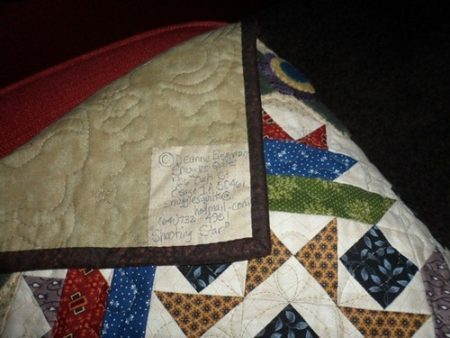 So many quilts I look at in books say “quilt maker unknown”. 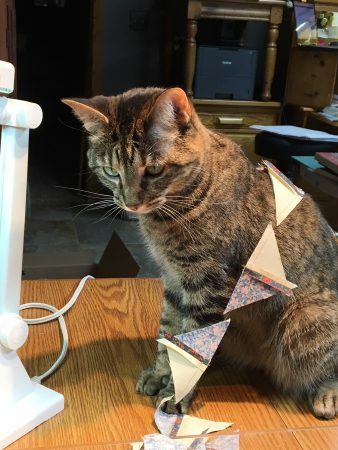 I wonder who made the quilt? Who was it for? What was the occasion? I have a few family antique quilts. but there was very little information about them when I acquired them. I have written down what little I know and have safely affixed that information to those quilts. 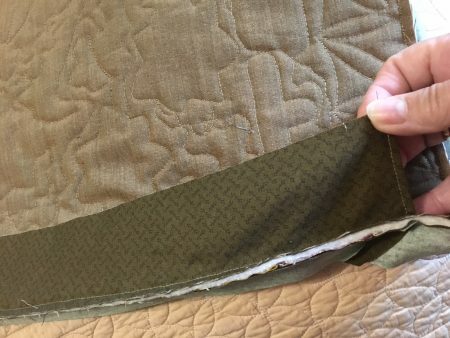 I don’t want this to happen to any of my quilts I design and make. At the very least, I make a label that includes my name, the name I’ve chosen for the quilt and the date made. I try to add more information when I can. This will help my kids when they own these quilts someday. If I am making a quilt as a gift, the label adds a beautiful touch and also serves to document the occasion. 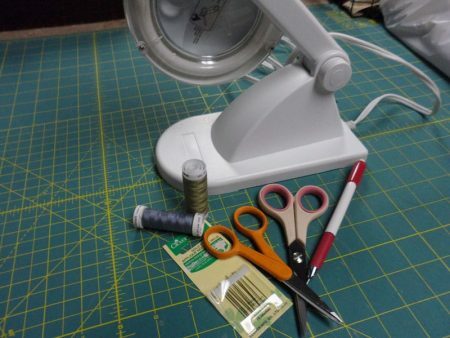 Be sure the fabric pen you are using is permanent and specifically made to mark fabric. That will insure that the ink is safe for fabric.The only drawback to this method is the possibility of the ink fading over time. Another way I have labeled quilts is by using fabric sheets for the printer that I have purchased at the quilt store. I did this on the back of my daughter’s high school graduation quilt. I included the class info and also the activities my daughter participated in. A drawback of this method is this paper is expensive (about $18 for 6 sheets). 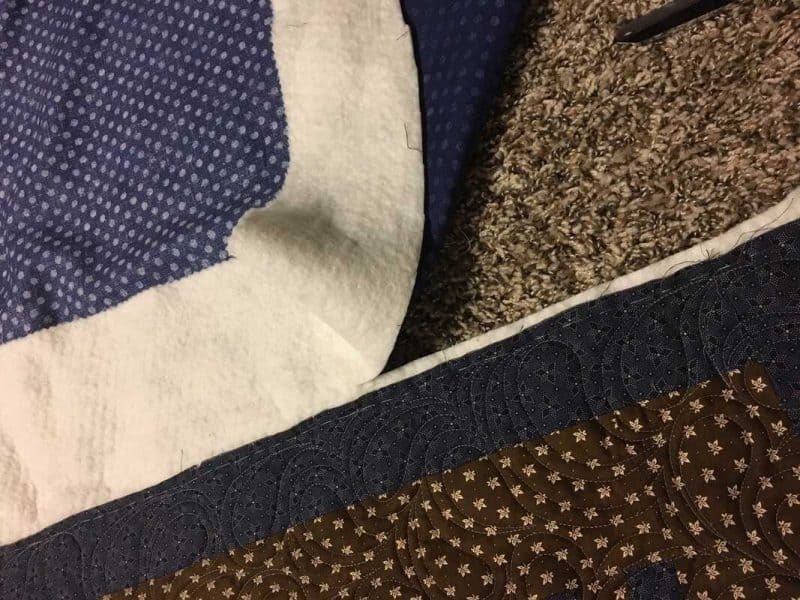 If you do not want to spend that amount you can purchase a fat quarter and make up to three labels by using freezer paper and Bubble Jet products. First, treat your piece of fabric with the Bubble Jet Set 2000 following the directions on the bottle. Place the fabric wrong side down on the shiny side of a piece of freezer paper. 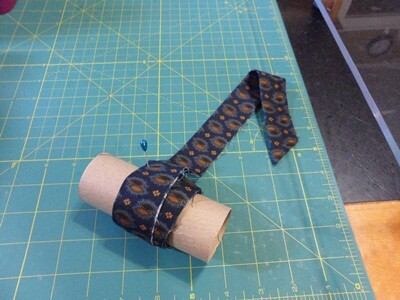 Then cut the fabric into pieces that will fit in your printer. You should be able to get three 8 1/2 x 11″ pieces out of one fat quarter. 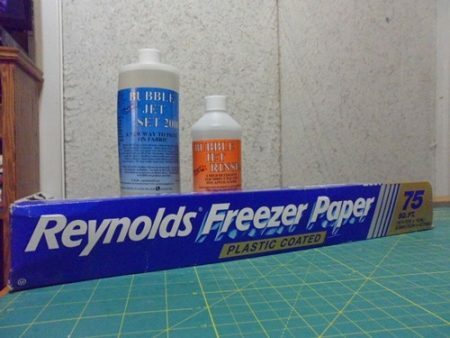 The freezer paper stabilizes the fabric so it can run through your printer. You must use an ink jet printer for this. A laser printer cannot be used because of the way it works and the heat generated with those types of printers. Next, type up whatever you want your label to say and print it onto the fabric side of you homemade labels. Be sure when you are designing your label, you leave enough space along the edges for a seam allowance. 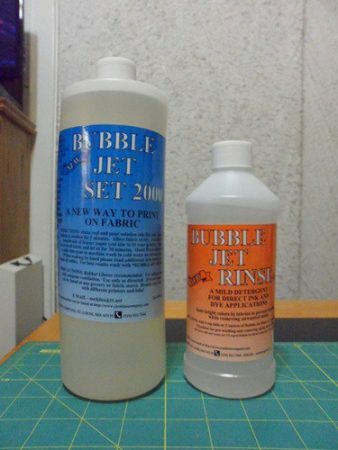 Finally, follow the instructions on the Bubble Jet Rinse to set the ink. Now your label is ready to use! If you do not want to use the Bubble Jet products (or can’t find them), you can set the ink with a hot iron. I have placed a sheet of paper on top of the label to protect my iron and the printed label. I use the “cotton” setting on my iron. Another idea that I used on a quilt for one of my kids is a signature label. I stabilized a piece of fabric by ironing freezer paper to the wrong side. Then I set it on a table for people to sign and add messages. 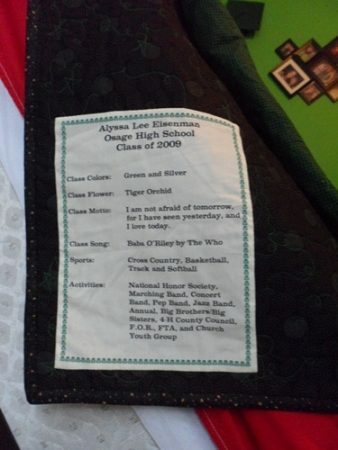 It’s a fun way to personalize the quilt. 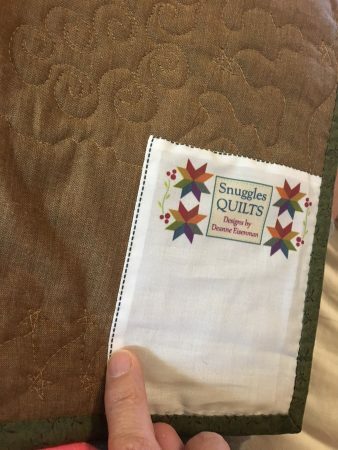 You can add regular label information to this label or put this on the quilt in addition to the traditional information label. I like the idea of using labels to tell a story, whether it’s for a member of your family or just for yourself. 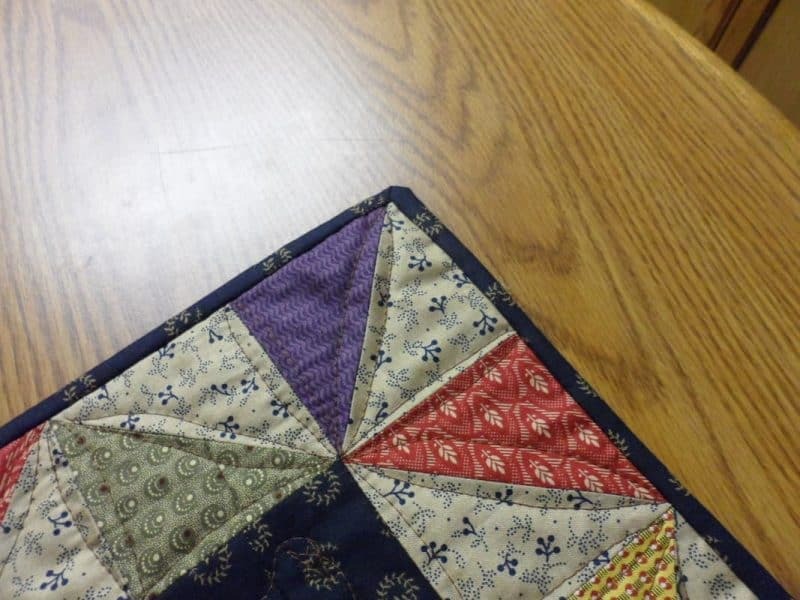 You can talk about what inspired you to make the quilt, what fabrics you used, the date it was made, etc. The possibilities are endless! I have even written a poem for the back of the quilt when I made one for one of my nieces. 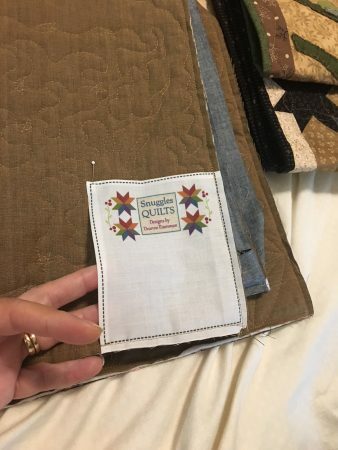 How do you label your quilts? I’d like to hear what you do and what you like to put on your labels.